Homemade stock is easy to make, just put some ingredients in water and allow to simmer for some hours. 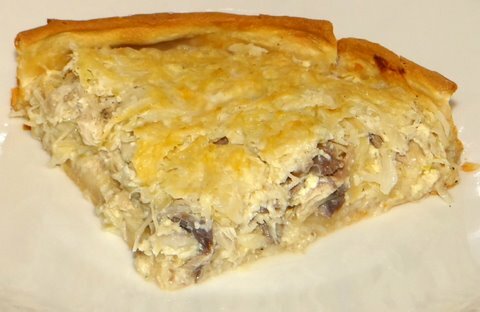 It is a good way to use up leftovers, including vegetable scraps and bones (after eating the meat off of them!). I like to use beef stock for beef dishes, lamb stock for lamb dishes, fish stock for fish dishes, chicken stock for chicken dishes… You get the message. And so I made pork stock to make Carne Adovada, and for Iberico Pork with Pomegranate, and for Iberico Pork with Celeriac. 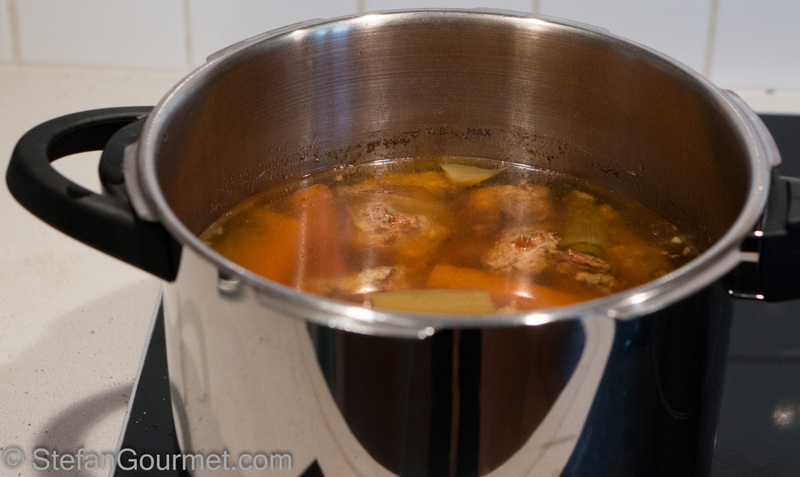 This pork stock has great depth of flavor and is very rich due to the gelatin. Many instructions in recipes for stock are to help keep the stock clear. This includes blanching ingredients, not allowing the stock to boil, among other things. 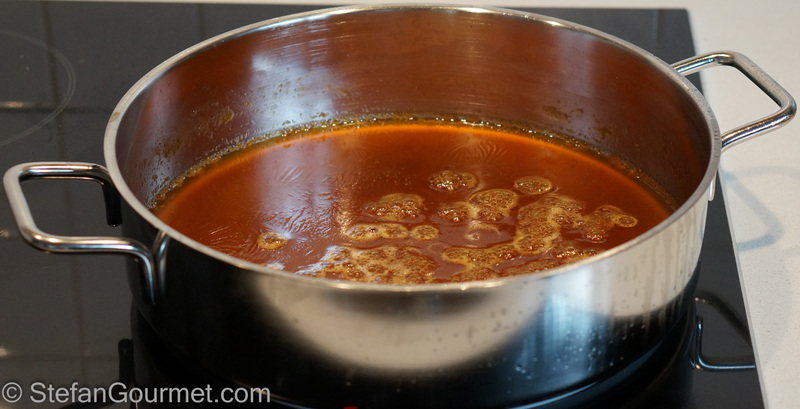 If you are going to use the stock in a way that you won’t notice whether the stock is clear or not (for instance, a thick sauce), you can leave out those steps. The meat flavor comes from meat, bones give off some flavor but mostly gelatin that will help to thicken the stock. So make sure to add bones if thickening is important, and make sure that if you make stock from bones that there is some meat attached to them for flavor. 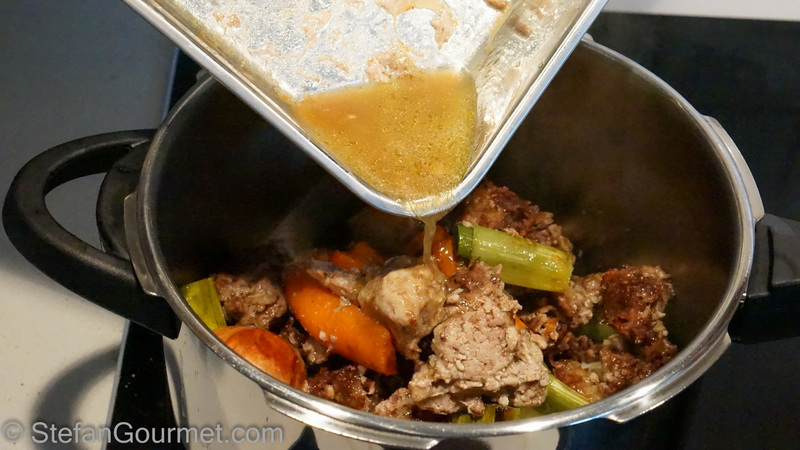 Flavor extraction is faster if the ingredients are cut into small pieces (therefore I use ground meat to make meat stock). The time it takes to make stock depends on the main ingredient. Beef takes the longest (4-6 hours), fish the shortest (20-30 minutes). Chicken (2-3 hours) and vegetables (1 hour) somewhere in between. Roasting ingredients before using them to make a stock will make a “brown stock” with a fuller flavor (and darker color). 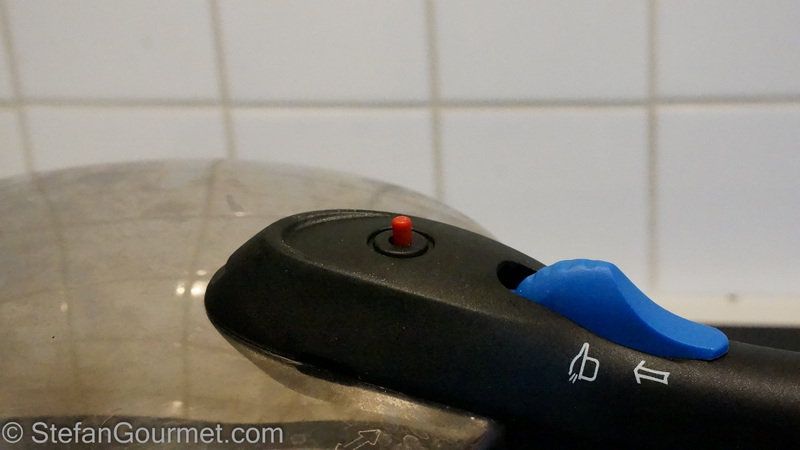 A pressure cooker provides better and faster flavor extraction. 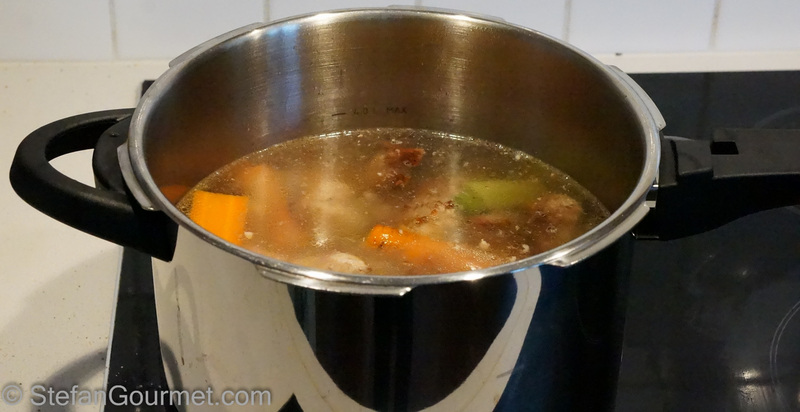 Use half the time in the pressure cooker as prescribed for a regular stockpot. To get rid of the fat, allow the stock to cool (first to room temperature, preferably in an ice water bath, and then in the refrigerator). You can then easily scoop off the fat. 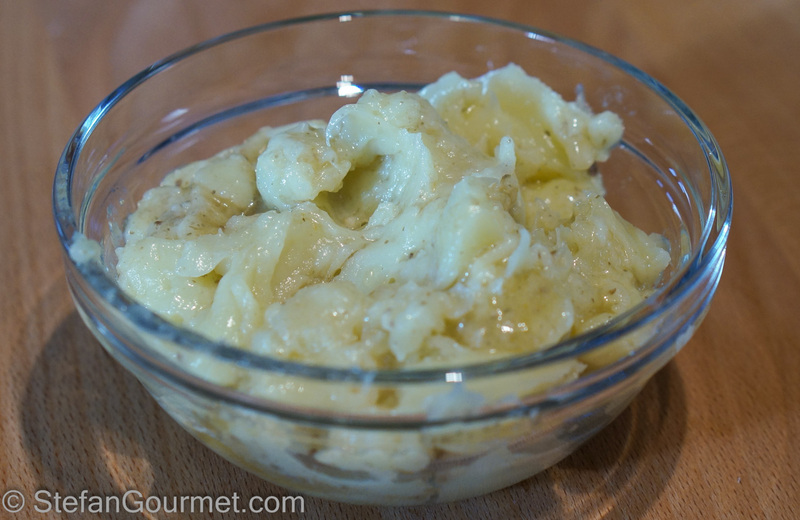 Don’t discard it, but use it instead of butter or oil in many recipes (e.g. to roast vegetables or to brown meat). Never put salt in stock before it has been reduced to the desired strength/thickness, as subsequent reduction would make it too salty. A collection of all my stock recipes can be found in the recipe index. Anyway, here is how I make pork stock. Preheat the oven to 190ºC/375ºF (fan forced). Roughly chop the vegetables. (Larger pieces of vegetables are OK in this recipe, as the flavor is extracted from them faster than from the pork.) Put the vegetables, ground pork, and pork trotter in an ovenproof dish. Roast at 190ºC/375ºF (fan forced) for half an hour, or until nicely browned. 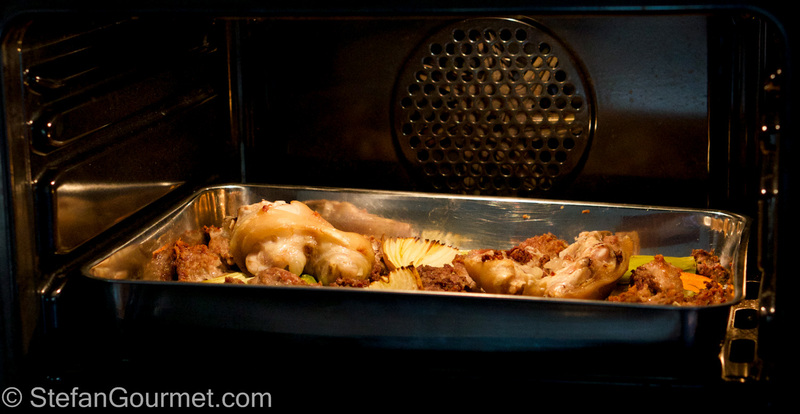 Transfer the contents of the oven dish to a pressure cooker or stock pot, including all the juices. Deglaze the oven dish with some of the water. 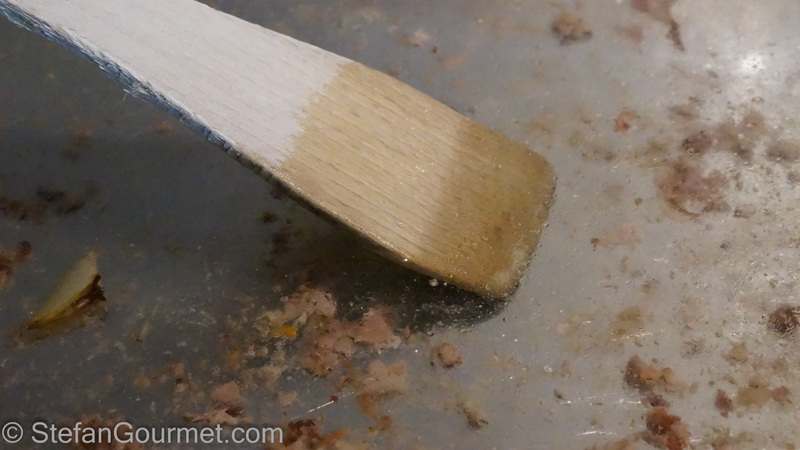 Scrape the bottom of the oven dish with a wooden spatula to include all the tasty bits into the stock. 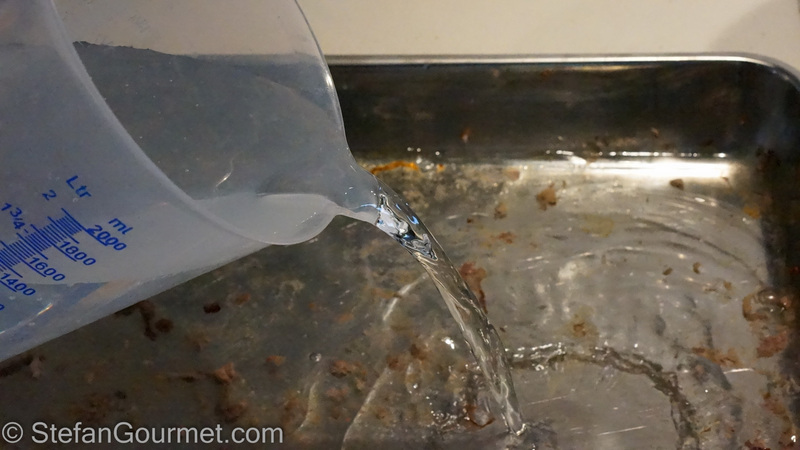 Add all of the water, including that used to deglaze the oven dish, to the pressure cooker or stock pot. Cover and bring to a boil. Reduce the heat and pressure cook for 2 hours or simmer for 4 hours in a regular stockpot. Turn off the heat. If using a pressure cooker, wait until the pressure has dropped or help things along by pouring cold water on top of the pressure cooker. 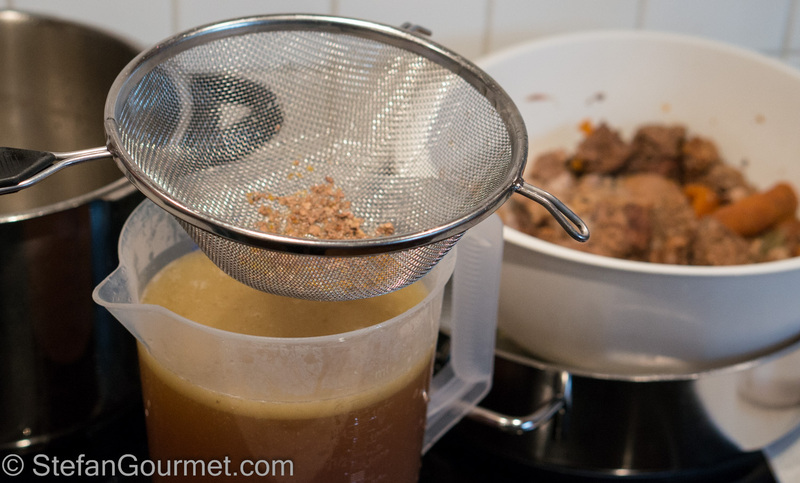 Drain the stock using a colander first to get rid of the larger solids. 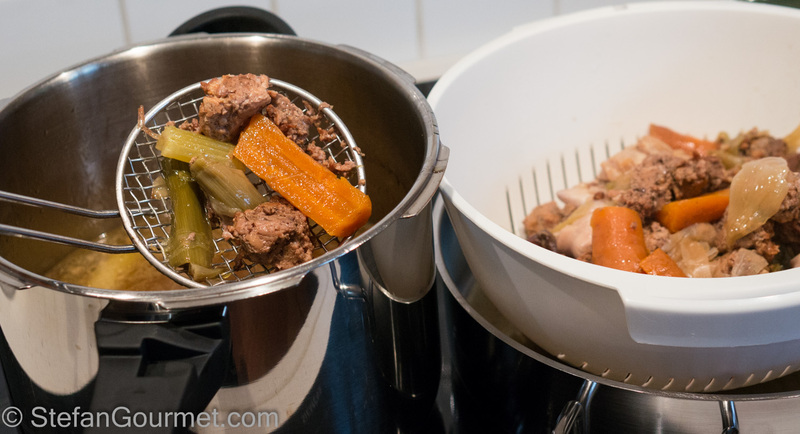 Use a fine sieve to eliminate the smaller solids as well. Allow to cool down (first in an ice water bath, then in the refrigerator overnight). The fat will rise to the top and solidify. It is now easy to remove. Reserve the fat and use it to roast vegetables or to brown meat. It is very flavorful. 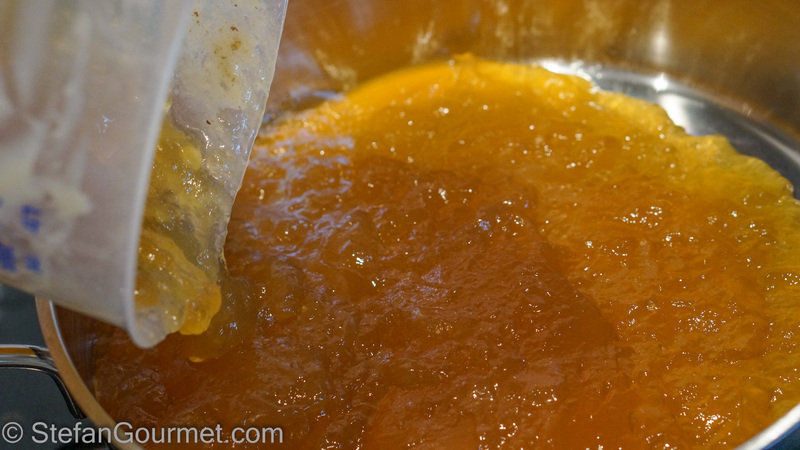 …bring to a simmer and reduce as much as desired. 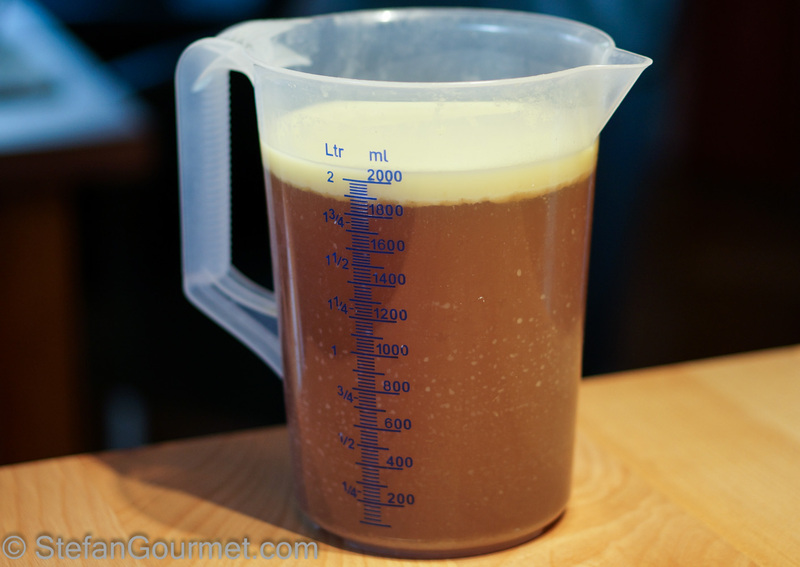 Reduce to 125 ml (1/2 cup) to obtain a delicious pork demi-glace. Stock can be stored in the refrigerator for a few days, or frozen for months. 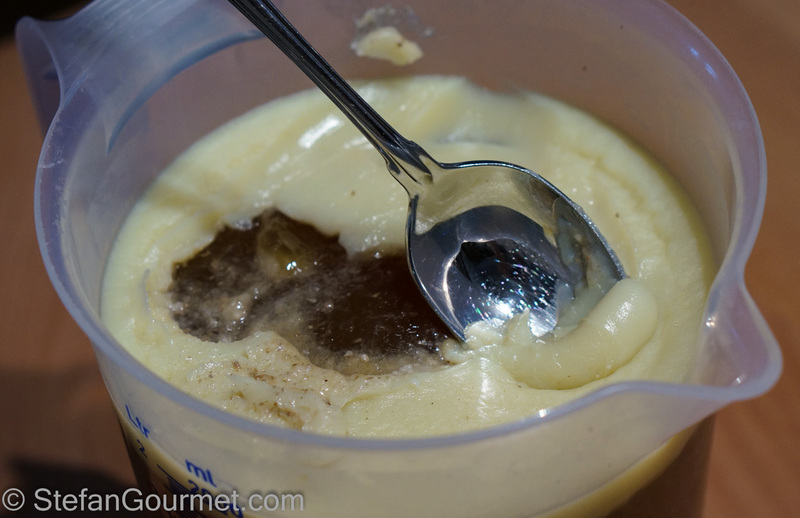 The reduced version frozen in an ice cube tray makes for a very easy way to make sauces or otherwise add flavor to your dishes. Conor calls them flavor bombs, which is exactly what they are. I’ve never made pork stock! Now I must. Thanks! I always make my own stock, it is SO much better… I normally do a two-in-one by cooking meat I want tender, such as spareribs, and then I take care of the stock. I also save the “trimming” when I take off hard parts, small pieces with bone, etc, so I have some discarded meat in the freezer to use whenever I need a stock. Well done, Stefan, we all need to be reminded of how to use all pieces of the animal, and how easy it is to make our own stock. Great advice! I can’t imagine a kitchen without good home made stock in the freezer. I know an extraordinary chef/teacher who calls stock the cornerstone of the kitchen! A lot of good points on that stock checklist! Must admit I have not used minced meat to make my stocks, but this is the second time I have read the advice on your blog so simply must try! Also have to think back wondering whether I have made pork stock: the others are always in the freezer . . . as I work from home, love the aroma wafting from my kitchen on cooking days!! Thanks for the shout out Stefan. The method is pretty perfect. I admire the organised looking tray that went into the oven. Good recipe. 1 little improvement during the sieving stage: try forcing juice out of the veggies with the back of a spoon.